JAKARTA – The Ministry of Energy and Mineral Resources (ESDM) opens an opportunity to provide subsidies for the Pertamax fuel in 2020. 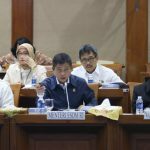 “There is a discourse on subsidies to be reversed, Premium fuel will no longer be subsidised, but Pertamax is to be given subsidies,” ESDM Minister Ignasius Jonan said in a meeting with the Lawmakers (DPR) in Jakarta, by the end of March 2019. According to Jonan such notion originated within a proposal from several legislators in Commission VII. The reason for giving subsidies to Pertamax is to encourage people to switch to use environmentally-friendly fuel (Pertamax produced by the SOE Pertamina), rather than the long-subsidised Premium fuel. Jonan said that the discourse would be submitted to the upcoming 2020 State Budget Plan (RAPBN). Previously, the House Budget Committee Working Committee Meeting approved the allocation of energy subsidies of IDR 157.79 trillion in the 2019 RAPBN, or an increase of Rp 1.25 trillion, from the initial draft of IDR 156.5 trillion. “We can approve the fuel subsidy of IDR 100.68 trillion and electricity subsidies of IDR 57.1 trillion,” said Chairman of the DPR Working Committee Said Abdullah. The energy subsidy ceiling has considered an increase in the exchange rate assumption from the previous IDR 14,400 per US dollar to IDR 14,500 per US dollar assuming the Indonesian Crude Price (ICP) price of 70 US dollars per barrel. This energy subsidy consists of subsidised fuel and gas for cooking (three-kilogram liquefied petroleum gas, LPG) of IDR 100.68 trillion. The details, for BBM amounting to IDR 33.3 trillion, three kilograms of LPG of IDR 72.32 trillion, it already includes carry over of IDR 5 trillion. Head of the Fiscal Policy Office of the Ministry of Finance Suahasil Nazara said the change in the energy subsidy ceiling allocation for the 2019 RAPBN was due to an increase in the exchange rate assumption of IDR 100. “The increase in this assumption made the energy subsidy ceiling increase by IDR 1.25 trillion “IDR 156.5 trillion to IDR 157.79 trillion,” he said. Subsidies for fuel and three-kilogram LPG recently increased by IDR 616.5 billion and electricity subsidies rose by IDR 642.7 billion from the initial draft. The provision of fuel and LPG subsidies has also considered the adjustment of fixed diesel fuel subsidies to IDR 2,000 per liter. Still related to the price of fuel, recently Minister of Energy and Mineral Resources (ESDM) Ignasius Jonan also stipulated the Decree of the Minister of Energy and Mineral Resources Number 62 K / 10 / MEM / 2019 concerning the Formula for Basic Prices of Specific Types of Fuel and Types of Special Fuel Oil. This rule was set on 2 April 2019. This stipulation is to implement the provisions of Article 14 paragraph 2 of Presidential Regulation Number 191 of 2014 concerning Provision, Distribution and Retail Price of Oil Fuel as amended by Presidential Regulation Number 43 of 2018 concerning Amendment to Presidential Regulation Number 191 of 2014 concerning Provision, Distribution and Retail Price of Oil Fuel. The new regulation is also intended as an adjustment to the basic price formula for certain types of BBM and the type of special mandatory fuel (subsidised fuel). The basic price formula for the type of fuel specifically assigned to the type of gasoline with a minimum RON of 88 is set with a formula of 96.46 percent of the minimum RON gasoline of 88 + IDR 821 per liter. Furthermore, the basic price formula for certain types of fuel and special fuel for this assignment is used as the basis for calculating the base price for each particular type of fuel oil and special assignment fuel. If needed, this basic price formula can be evaluated at any time by considering the realization of factors that affect the supply and distribution of certain types of fuel and special fuel assignments.